Click on photos for detailed instructions & click on what you will need for the requirements list. Or follow the text for how to make pumpkin bowl. a) Find a good pumpkin with an interesting shape (photo 1). If you have friends with an allotment, they may be able to give you a pumpkin. Start small and make a few small bowls before you tackle a large pumpkin. b) Place your pumpkin bottom up. Cover your pumpkin with cling film (plastic wrap, cling wrap or food wrap) (photo 2), and make sure you press the cling film into the grooves and recesses of the pumpkin (photo 3) and to its underside. a) Tear a few pieces of handmade paper. TIP: You can use plain handmade paper (Natural Lokta Artists Paper) for the inner layers as they will not show in the finished pumpkin bowl. Fill your bowl with about 2 cm (½ inch) of water. Place a few pieces of torn paper in the water. Leave them in the water for a few seconds until they become wet. This takes less than a minute (photo 4). b) Lift the wet paper and place each piece against the inner side of the bowl, leaving a corner of the paper sticking up above the rim of the bowl (photo 5). This makes it easier to pick up the piece of paper in the next step. Leave a small space between each piece otherwise they will stick together. Let the excess water drip for a minute or two. a) Brush some wallpaper paste on the cling film that you have covered the pumpkin with. Pick a piece of drained paper and place it over the paste. Brush a little paste over it. Place the next piece of paper on the pumpkin overlapping the first piece (photo 6). a) Apply more adhesive. Keeping adding more pieces. Don’t use too much adhesive, otherwise the paper will take a long time to dry. You will soon figure out how much glue to use. Keep the paper wet but without the glue running off. Use your fingers to press the damp paper into the grooves & recesses of the pumpkin (photo 7). b) Repeat until you have covered the bottom half of the pumpkin with a layer of paper. Let it dry overnight (photo 8). c) Turn the pumpkin up the right way (photo 9) and place paper on the top of the bowl as you did before. Leave the area around the pumpkin stem without paper, as this will be the opening for the bowl (photo 10). Let this dry overnight. Repeat the procedure above until you have built up 3 or 4 layers of paper and let it dry well. a) Using a craft knife, carefully make a cut through all the paper layers (photo 11). Cut from the top towards the bottom of the pumpkin, but leave the bottom uncut. Repeat this cut with further cuts each about 10 cm apart. b) Gently loosen the paper away from the pumpkin and then find a friend to help you remove the bowl from the pumpkin (photo 12). If necessary make the cuts a little longer. 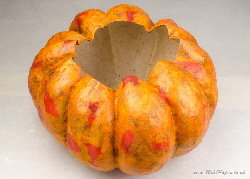 The pumpkin bowl should be all in one piece when you have removed it from the pumpkin (photo 13). a) Hold the bowl together with 2 or more strips of masking tape (photo 14). b) Use wet lokta paper and wallpaper paste to cover the cuts (photo 15). This is very similar to applying band-aid to a cut in the skin. Do this on the inside and outside of the pumpkin. Be careful not to go over the masking tape. c) Remove all the masking tape and keep adding more layers until the bowl is strong enough. a) Cover the bowl with lokta tissue paper. The tissue paper is so thin that you don’t need to soak it in water first. You may like to cover the pumpkin with a layer of brown tissue paper (photo 16), and then cover that with two tones of orange tissue paper (Orange and Tangerine tissue paper) (photo 17). Use small pieces of tissue paper, at this will give it a more interesting colour where the pieces overlap. b) You could cover the inside of the bowl with a flecked light colour paper, like the Lokta Hemp paper. c) When the bowl is thoroughly dry, apply several coats of beeswax to the paper bowl (photo 18), buffing the beeswax between coats.